"Don't let setbacks in life be the end of your goal"
My alarm went off at 3:30am and I didn’t even fight it. We left the house at 4:45am and arrived at the race at 5:10am. Because it was still quite dark out, the Christmas lights were illuminating the streets. It was beautiful. 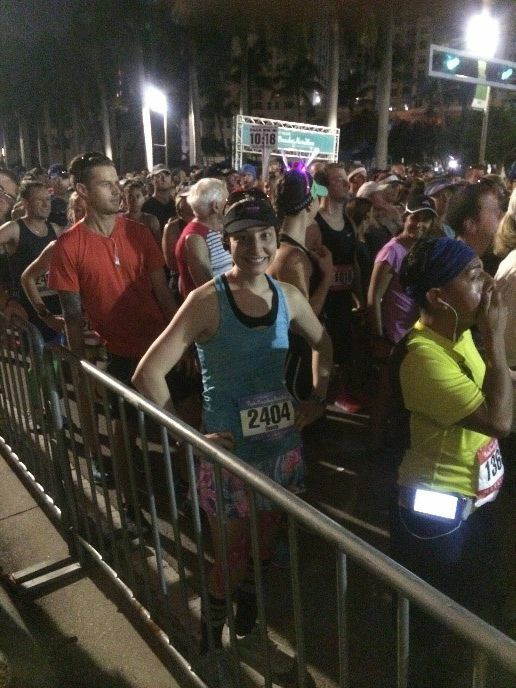 I chatted with my mom and dad, stretched a little bit and got into the starting line around 5:45am. I reached the third mile and the first recording from my sister played through my Bluetooth speakers. Made me smile so big. By the fourth mile, it was no longer nice out. It was downright hot and humid, and it would only get worse as the hours ticked by. Nothing much happened from 4-7.5 miles. Things were where they needed to be. I watched the incredible sunrise during that time period (so wish I had taken a picture of the sky) and was just happy telling myself I was more than half way there and that I could do this. Well it was short lived when I got to 7.5 miles. I enjoyed the next recorded message from my sister, but I really thought I was going to be sick, so I walked for a half mile. Had some Gatorade around the 8th mile (as well as the 3rd, 6th, and 11th). I honestly think that was a bad mistake on my part. My stomach just can’t handle Gatorade. But I kept going. A little over the 9th mile, I spotted two familiar faces in the crowd and two amazing supporters and friends of mine. Debbie and Scott were at the perfect spot at the exact moment I needed to see them. Again, God works His magic. I made it to mile 10 when the third message from my sister came through my music. She told me I just had a 5K to go! On any other day, I would have just bolted. But today was not like other days. My stomach decided to start having issues and it’s nearly impossible to try and run through it. So, I walked from mile 10-13. Mentally, I was in the race the entire time. I never doubted myself. It was the physical aspect that got me today and that was hard to comprehend as I’ve never endured that during a race. That’s why they call it a comeback because it’s not the same (Deena has experienced serious health problems in the past - you can read her story here). It just puts in perspective how you can really take things like races for granted and always get so caught up in the moment that you don’t truly value what you are doing or achieving. At this point, I knew I would never make 2:30 and I was okay with that. During those rough miles, I just prayed, and I thanked God for showing me how challenges really make you strong and really allow you to persevere through it all. It was as if, at that moment, everything from the past two years all flashed in front of my eyes. And I was like WOW! And in an instant, I counted my blessings and thought about the women and children who we help get out of modern-day slavery. The final message I received was about 12 miles in. My sister included not only a message with her but also Mely (my niece) and that’s when I got teary eyed. Thanks, twinny for all the incredible messages. Seriously helped get me through. Debbie and Scott found me when there was less than a mile to go. Debbie walked with me and that was such an impactful moment knowing that she was going to help me finish what I started. As soon as I heard the music and saw the people, I found the strength to run the last few yards. 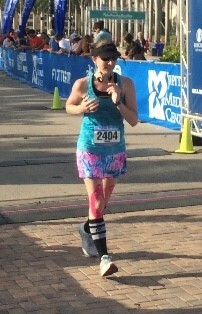 I crossed the finish line and was instantly overcome with gratefulness. Today, I realized that the time on the clock really means nothing to me and that by overcoming all that I have in the past couple years and being able to achieve this was all I need to be proud of myself. Thank you to not only my parents and Debbie and Scott, but for all of you at home near and far who have been praying for me, encouraging me, and supporting me. The phone calls and texts have made my day. I am so loved and that’s a great feeling. Many thanks to the Freedom Challenge for this incredible opportunity. You are an awesome support system and I am so honored to be part of an amazing family. My final time for those asking: 2:52:30. An hour more than my PB, the hardest out of the five half marathons I have now run, but the most fulfilling and most rewarding. My final words are this: Don’t let your setbacks in life be the end of a goal. It won’t be easy, you will suffer some losses and tough times, but you will also come out stronger. Thank you, God, for answering my prayers. We did it Freedom Challenge! Deena ran her race to raise funds for Freedom Challenge as part of our individual / team challenge - you can do this too! You can find out more here.